Local stop smoking services were established in England in 1999 as part of the Government’s commitment to help smokers to quit. These services have been phenomenally successful and to date have helped over 4 million people to successfully quit for at least 4 weeks. Even with known relapse rates this amounts to a million long term ex-smokers, defined as smokefree for more than 12 months. However, the numbers using these services have declined in recent years. The most recent data for 2014-15 shows that 450,582 smokers set a quit date with their local service, a drop of 55% compared to their peak in 2011-12. 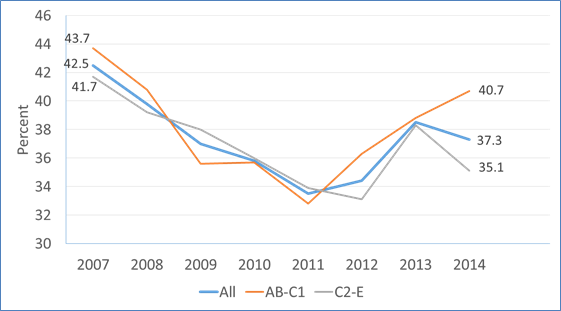 This blog explores some of the reasons for this decline as well as identifying some of the ways these could be addressed – both at local level and national. 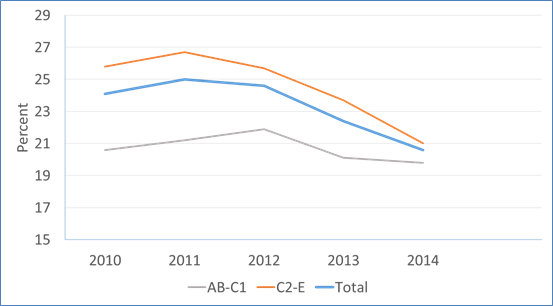 The Smoking Toolkit Study finds that the number of people who report trying to stop smoking has not declined in recent years (with a slight dip amongst the C-E populations in 2014). Data from smoking toolkit study: www.smokinginengland.info, Base: people who smoked in the past 12 months. So why are fewer people choosing to quit through a stop smoking service? The growth of e-cigarettes has been well documented and has played a role. There are around 2.6 million users in England and over 30% of quit attempts in the past year have involved use of e-cigarettes, substantially higher than any other aid to cessation. E-cigarettes currently appear to have similar effectiveness to nicotine replacement therapies (NRT) such as gums or patches which can be obtained on prescription, but are likely to be most successful when used in conjunction with support from a stop smoking service. In fact, recent data shows quit rates of around 66% for those using an e-cigarette alongside the behavioural support of a stop smoking advisor. Unfortunately most people still try to quit either with no support or with NRT bought from a shop, rather than accessing the more effective routes that we know increase success rates. The information reaching smokers about their local stop smoking service may have reduced in recent years. 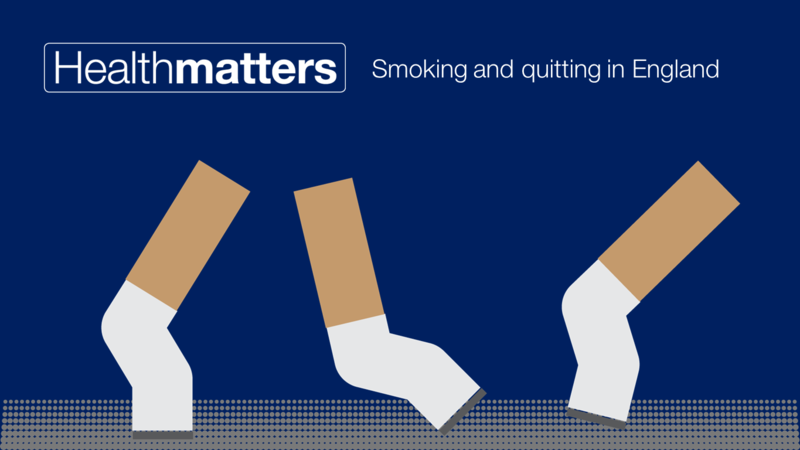 Smokefree campaigns are now focused on triggering immediate quit attempts at a population level and signposting people to information about the variety of different quitting options, rather than signposting directly to local services. Reasons for this change in strategy include reduced campaign budgets with an increased focus on digital, alongside structural changes in the NHS, meaning there isn’t a consistent universal offer of an “NHS local stop smoking service” across the country. These structural changes have fundamentally altered the services now on offer. Across the country we have seen a move away from the traditional model of specialist services with dedicated advisors running closed groups or drop-in sessions in a range of settings, towards more community-based provision with advisors who also have other roles (e.g. pharmacist, practice nurse). While the evidence base remains strongest for the more specialist model in achieving high success rates, a combination of both is important to ensure the needs to all local smokers are being met. The evidence is also clear that advice from a GP is one of the most important factors in triggering quit attempts. Whilst there is a range of guidance and training available to promote both the ‘why’ and ‘how’ of raising the issue and referring to specialist services, data from the Smoking Toolkit Study indicates that the number of smokers receiving an offer of support from their GP has declined. Why is it important to create sustainable stop smoking services? There are still almost eight million smokers in England and local stop smoking services remain an important and effective intervention. The evidence from the Smoking in England Toolkit continues to show that the most effective way to stop smoking is through a combination of behavioural support and medication, which is provided by specialist practitioners trained to deliver these interventions who work in a range of health and community settings. What can be done locally to encourage more smokers to use the most effective support? Ensuring high quality interventions are provided to all smokers accessing support regardless of setting or intervention type. Providing information on and access to all licenced stop smoking medications, including NRT in combination. Supporting stop smoking services to engage with smokers interested in using e-cigarettes as a way of quitting smoking, providing behavioural support to those who choose to use these products to help them quit. This would combine the most popular approach with the most effective one. Commissioners and providers remaining aware of the evidence base relating to the specialist function of stop smoking services. Ensuring services are commissioned in line with existing evidence based guidance. Training and mentoring of practitioners, monitoring performance and evaluating outcomes. Promoting what and where stop smoking support is available, highlighting how this increases the chances of quitting successfully. Ensuring both smokers and healthcare professionals know that support is available, how to access it and how it improves the chances of quitting. Optimising local amplification of national campaigns. Demonstrate the potential cost savings at practice, CCG and Trust level through treating smokers, who are also likely to be high users of other NHS services. Embed the delivery of Very Brief Advice on Smoking so that all smokers are asked about their smoking, advised on the most effective ways to quit and sign posted to services for support. Emphasising the clinical imperative of providing interventions for people with a serious addiction that has implications for health and life expectancy. I would like to offer an alternative analysis from the perspective of a member of the public whose health is paramount to both of us.I smoked for 35 years and quit 6 years ago by using an ecig(which I still use). 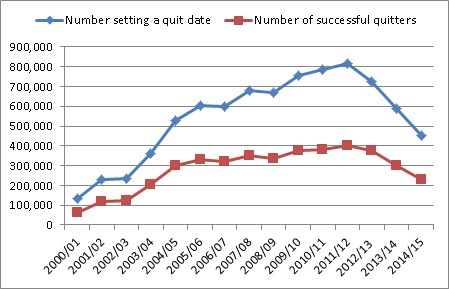 Whilst there have been over 8 million quit attempts made via the SSS,it is more useful to look at the longer-term success of these attempts.The ELONS study,originally due to be published in November 2014,has still not appeared.The provisional results disclosed at last year’s UKNSCC conference suggest at one-year success rate of ~8%-and consequently,a life-time rate of ~5%.These figures may be overstated as the sample did not appear to be at all representative of the national mix of providers. A useful check on effectiveness can be made against the annual ONS survey data.This shows that the proportion of ex-smokers in the adult population reached ~24% in the mid-1980s and has remained there ever since.The implication is that the introduction of the SSS,its peak throughput in 2012 and the various bans that have introduced have had no measurable effect. Whilst, in the absence of anything better, it is possible to argue for the current idealist system i.e a benevolent Public Health movement lifting the poor smoker out of their addiction, the advent of ecigs changes the landscape.The continual adherence of Public Health to the traditional blueprint has had the unfortunate effect of exaggerating safety concerns and belittling their effectiveness. I appreciate your attempt to set the record straight on safety – I winced at your unwillingness to recognise the truth about effectiveness. This is understandable given the natural human concerns about career,reputation,etc but I would urge you to look dispassionately at the evidence – not massage it to fit an over-optimistic public message.If you really believe the preface to every tobacco control missive concerning the number of smoking-related deaths each year,you would rethink your current strategy.The future is free-range ecigs-that's the message you need to get across.Without the requisite enthusiasm for and knowledge about ecigs,I doubt the SSS can make much difference. "E-cigarettes currently appear to have similar effectiveness to nicotine replacement therapies (NRT) such as gums or patches which can be obtained on prescription, but are likely to be most successful when used in conjunction with support from a stop smoking service. In fact, recent data shows quit rates of around 66% for those using an e-cigarette alongside the behavioural support of a stop smoking advisor." I have to say this seems like nothing more than protectionist propaganda. 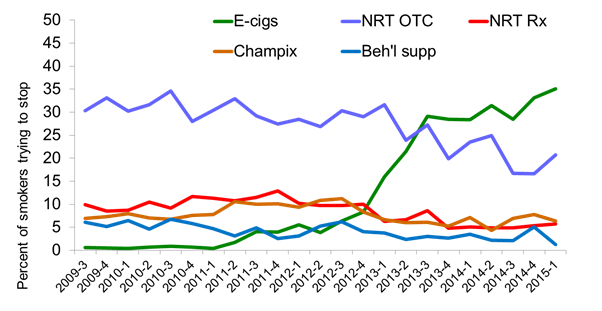 The need to justify funding these stop smoking services obviously flies in the face of the facts that people who want to give up smoking are doing in vast numbers - as per your graph - by using vaping off their own bat without accessing these services or visiting the doctor and receiving the usual patronising claptrap. It is shameful that these vested interests and the inbred opposition to anything remotely "smoke" related in the medical community is resulting in misleading information on "e-cigs" (an already perjorative term) being widely peddled and this will directly cause unnecessary deaths by scaring people away from a solution which is the most effective method of stopping smoking. Indeed the clumsy calls for regulation both domestically and at the disastrous EU level threatens to reduce access and destroy an alternative which threatens to make tobacco obselete. You should be positively promoting vaping as a safer alternative to tobacco instead of providing confusing messages to protect your funding. Is it too much to expect objectivity from public bodies? To quote a well known vaper "smoking is dead vaping is the future and the future is now".